Planned Parenthood: All or Nothing? One of the most striking things about Planned Parenthood's defenders is the general unwillingness, or perhaps inability, to consider Planned Parenthood's abortion "services" apart from the rest of their services. The videos released by the Center for Medical Progress at a minimum should warrant some kind of an investigation. Especially in light of today's fifth video, which shows Planned Parenthood employees in Houston claiming to be able to provide "intact specimens", one would think that even the most ardent defender of Planned Parenthood would want to know more about what's actually going on there. Other examples abound. But this is, at best, a distraction. Presumably Planned Parenthood could continue to offer this kind of care should it stop performing abortions. Investigating its conduct concerning abortions has little effect on the rest of its services. It makes me wonder if Planned Parenthood supporters see PP as an all or nothing deal? They seem to be touting all the services that PP provides other than abortion, and yet they are unwilling to allow its abortion services to be investigated. I am sure that Planned Parenthood does provide important services to women who have few places else to turn to. But this isn't about that. This is about the willful destruction of defenseless humans. Here is the crux of the issue: abortion is the willful murder of a child. No amount of good deeds can absolve Planned Parenthood of their murder! That Planned Parenthood's supporters choose to overlook this is instructive. It speaks to a massive and systemic moral failure. Whether they are the type of person who irrationally believes that a viable baby is not a human being deserving of the same rights and protections of other humans, or whether they are the type of person who doesn't believe a viable baby is human, they have failed in their duty to develop a rational morality. So how do those of us who are still capable of calling a spade a spade deal with this? Honestly, I think we're moving in a pretty good direction. There is, however, lots of confusion present. We should do our best to clarify issues (for example, this isn't about Planned Parenthood, this is about abortion). The other thing we should be doing is to call the pro-choice movement out on their extremism whenever the opportunity presents itself. And make no mistake, extremists they are. We now have five videos showing, at an absolute minimum, evidence of possible illegal sales of human body parts. This is the sort of thing that warrants some kind of investigation, and yet we have the White House admitting to taking Planned Parenthood at its word. The American pro-choice movement is an extreme outlier. The American left's cry for "Free abortion on demand and without apology" literally has no equal. In Germany, a woman seeking a first trimester abortion must attend a counselling session. In Belgium there's a six day waiting period. In Europe in general it's incredibly difficult to get an abortion after 20 weeks. The American pro-choice movement are the extremists here. 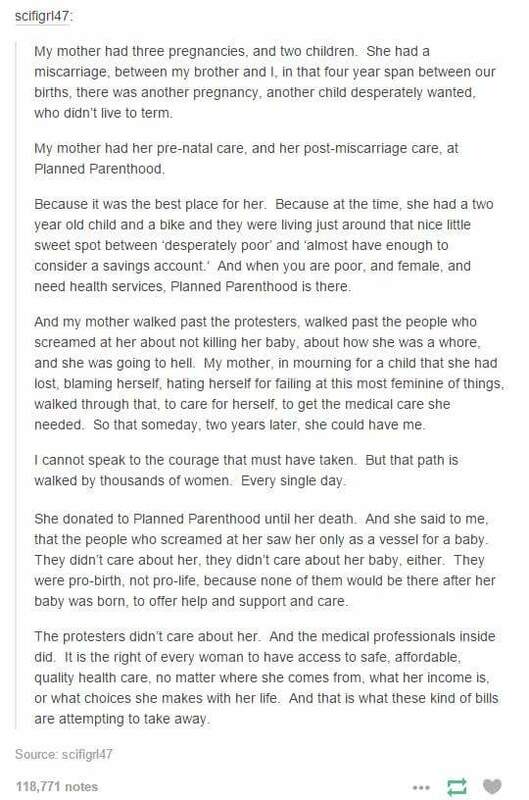 Remember that the next time someone calls the pro-life movement extremist. Which brings me back to this posts title, does Planned Parenthood have to be all or nothing? Or course not. The questionable abortion practices can be investigated without affecting their other services. Planned Parenthood could even protect their funding by simply agreeing to stop providing fetal tissue. If they are telling the truth about not profiting off of those tissue donations, then this should not be a big deal. But somehow I doubt that people who see no problem dismembering babies are entirely on the up and up.